This template has a trendy large image background, which would make your agriculture look modern and attractive. The pics of beautiful wheat fields are sliding to add to your website more dynamics. The other elements are rather minimal: the dropdown menu for comfortable navigation and social icons for auto-promotion. Responsive design is a method of website design that allows pages to adjust to a screen resolution of any kind of device - be it a desktop computer, a tablet or a smartphone. Responsive design provides a much better UX for people who visit a site on a mobile phone or any other gadget, as well as helps to improve rankings of a website in Google search. SEO Friendly is the kind of web design that allows search engine spiders to explore and index its pages. You don't need to be a pro at SEO to get high rankings in Google. WordPress SEO plugins allow to write SEO-friendly title tags and meta descriptions, not to mention analyze on-page content, let you create XML-sitemaps, and much more. Bootstrap is a costless front-end framework which provides for a lot quicker and also hassle-free web development expertise. In what cases I don't need the extended license for Business Company Joomla themes? What do I receive when I order a Agriculture Joomla design from TemplateMonster.com? After you complete the payment via our secure form you will receive the instructions for downloading the Agriculture Joomla design. The source files in the download package can vary based on the type of the product you have purchased.If you need unzipping software to open the .zip archive, Windows users may visit www.WinZip.com, Mac users may visit www.StuffIt.com. Can I get the extended license for some other pricing than the half of the initial Joomla design theme for Agriculture Business price? No. The price for purchasing license for a single Joomla design theme for Agriculture Business is the half of the template unique price. What are the advantages of purchasing a Joomla template for Business Company? The major advantage of purchasing a Joomla template for Business Company is price: You get a high quality design for just $20-$70. You don't have to hire a web designer or web design studio. Second advantage is time frame: It usually takes 5-15 days for a good designer to produce a web page of such quality. 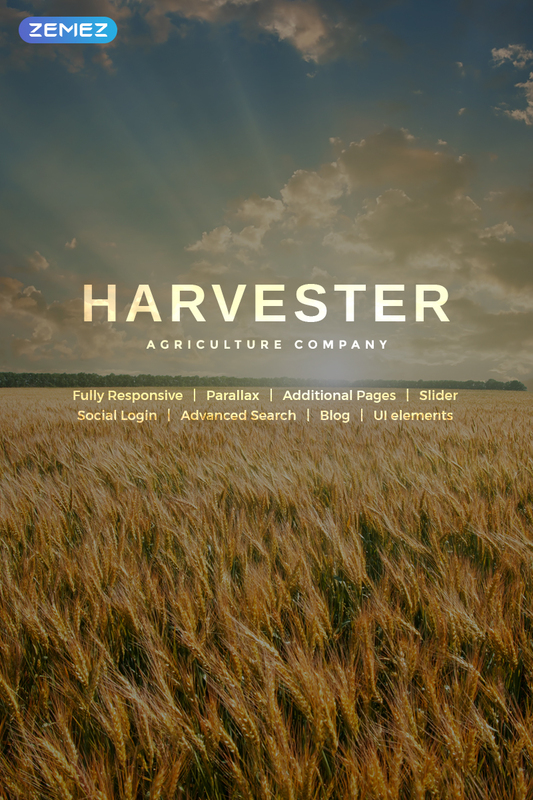 Can I use graphics from Agricultural Company Joomla design I purchased for use in printing? Yes, it's not prohibited to use the Agricultural Company Joomla design graphics for printed material, but the resolution of the templates graphics ( except for logo templates) is not enough for printing. Can I resell the customized Small Business Joomla design? No, you cannot resell the customized Small Business Joomla design as a template but you may sell it as a project to your client (see paragraph 1 ONE TIME USAGE LICENSE for more details). Will TemplateMonster help me to install my Joomla design theme for Business Journal ? Some of our products like osCommerce templates, Zen Cart templates, etc. require installation to operate. Installation services are not included in the package price. TemplateMonster though offers you a variety of sources to help you with installation of your Joomla design theme for Business Journal including installation instructions, some articles with our Online Help Center. Our Knowledgebase contains customers questions and most frequent problems. Anyway, you can always refer to our partners from TemplateTuning.com to install your Joomla design theme for Business Journal for you for a small fee. Is there any return policy for Joomla templates for Business? Requests for a refund are accepted at www.template-help.com/tickets within the period of 2 weeks after the order of Joomla theme for Business Bureau is placed. You should accompany this request with detailed and grounded reasons why you apply for a refund. Please make sure your request does not contradict the terms and conditions specified in the policy. A refund is issued to you upon receipt of a Waiver of Copyright signed by you. Can I put low resolution thumbnails of Business Bureau Joomla design themes on my website for my clients to choose designs? Can I apply a discount code to a discounted Joomla design theme for Agriculture Business or combine several discount codes together to get better price? Is it possible to buy the particular image from the Agriculture Industry Joomla design theme? No. According to our Terms and Conditions we never sell the images separately from Agricultural Products Joomla templates (as well as the templates separately from the images). You may: Build a website using the Business Company Joomla design in any way you like.You may not:Resell or redistribute templates (like we do).Claim intellectual or exclusive ownership to any of our products, modified or unmodified. All products are property of content providing companies and individuals.Make more than one project using the same template (you have to purchase the same template once more in order to make another project with the same design). Is it possible to reactivate my download link for Joomla design for Business Blog if it was deactivated after 3 days? Yes. Please re-activate the download link for Joomla design for Business Blog within your account under the Downloads tab or contact our billing department directly regarding that. Can I resell the Joomla design themes for Business Journal I bought the extended license for? No, you cannot resell the Joomla design themes for Business Journal as is. You can only sell them as the integral part of your new product. What is Extended License for Business Joomla theme? Can I put a line at the bottom (or any other spot) of my new product "Website development by Company name" after purchasing Business Company Joomla design? Yes, you can place a note at the bottom (or any other spot) of my product "Website development by Company name". Nevertheless, you cannot place "Website design by Company name" while using one of Business Company Joomla design. Can I get the Small Business Joomla design in higher resolution to use for printing? No, we design Agriculture Business Joomla themes optimized for web resolution only. What is a one time usage license for a Agricultural Products Joomla template? When you buy the Agricultural Products Joomla template at usual price you automatically get the one time usage license. It enables you to use each individual product on a single website only, belonging to either you or your client. You have to purchase the same template again if you plan to use the same design in connection with another or other projects. When passing files to your client please delete the template files from your computer. I would like to purchase Joomla design for Business Firm, but it is not available on the site anymore. The Joomla design for Business Firm has been sold out for exclusive price or discontinued.As technology inevitably develops, TemplateMonster may discontinue the production of certain products. It can be no longer available for sale because of being outdated. Can I put a line at the bottom ( or any other spot) of the customized Joomla theme for Agricultural Products "Website design by Company name"? No, you cannot place a line at the bottom ( or any other spot) of the customized Joomla theme for Agricultural Products saying "Website design by Company name". Nevertheless, you can place "Customized by Company name". Can I resell Business Bureau Joomla design themes I bought the developers license for? You cannot resell the customized Joomla theme for Agriculture Industry as a template, but you may sell it as a project to your client. Can I contact the Joomla design for Business Magazine author? Yes. You can contact this Joomla design for Business Magazine author/author's team directly using your personal account under the Support tab. Are there any discounts if I'm buying over 10, 20, 30 or more Small Business Joomla design? Please email to marketing@templatemonster.com with your inquiries about Business Company Joomla themes. I ordered a Joomla design theme for Business Journal but haven't received the download information. In case of not receiving the download information of a Joomla design theme for Business Journal , please contact our Billing Department via support chat by phone or e-mail. you can choose this one ! There is a Link to Template Monster in the left bottom corner which does not fit to the template at all (It destroys the Layout of the Copy-Right line) But all in all it is perfekt! Simple to use and looks great! Very easy to use and customize. Fully responsive and very attractive! The template is friendly. It is not like when you find all the modules or other stuff arranged on a way that is almost impossible to change. You can modify it easily with images, new text, new modules and colors. The good thing is that you can modify it so much it will not look like the demo. Happy cssing with this one! I have Joomla 3.3 install.. is this template compatible? if not, how can I install older version of Joomla? Hello, I have a website already, www.concertfantastique.com, can I put a background image like this in the background of the Joomla template, then have the &amp;quot;Kristoffer Karras&amp;quot; and the &amp;quot;Concert Fantastique&amp;quot; as the Header where the &amp;quot;Harvester&amp;quot; header already is. Basically I want to know how much can you change the site template.